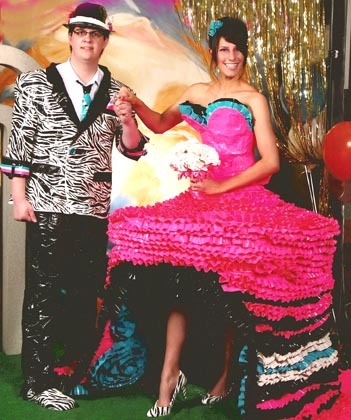 New entries are pouring in for the annual Duck® brand Duct Tape's Stuck at Prom Contest. This annual event has prom attendees competing for college scholarship money by making their prom gowns and tuxes using Duck brand's colorful array of duct tape. 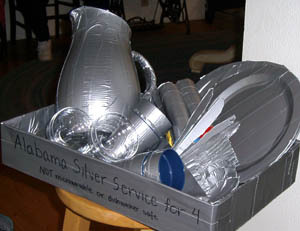 The entries have been phenominal over the years (as you can see on our Duct Tape Prom viewer). 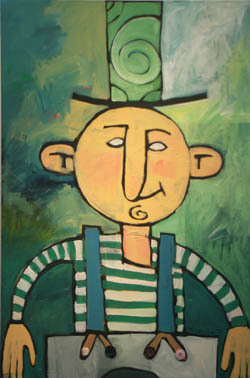 Click to DuckTapeClub.com to view and vote on this year's entries. You can also watch a video interviewing last year's winners here. Duct Tape Saves the Day! 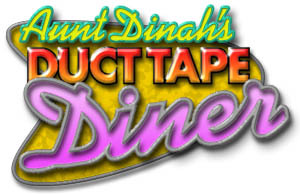 A wise man once said, "The one thing people love more than duct tape, is telling their duct tape story," and we agree. That's why the Duck Tape Club® announced the Duck® Brand Duct Tape "SAVES THE DAY" Promotion. They invited all those people with original and ingenius duct tape "SAVES THE DAY" stories competing for a grand prize of $5,000! Check out the winners at DuckTapeClub.com. Duct Tape Festival - year five! Hoist the colors and bring your best pirate impression to the fifth annual Avon Heritage Duct Tape Festival to honor the beloved roll known for its million and one uses. 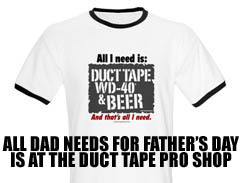 The three-day celebration over Father’s Day Weekend will feature a pirate theme and encourages duct tape fanatics, artists, kids and adults to salute America’s favorite fix-all. The festivities kick-off Friday, June 13 at 4:00 p.m. at Veteran’s Memorial Park in Avon, Ohio, and feature everything duct tape  from sculptures and crafts to fashions and games. There is even a parade featuring duct tape floats. 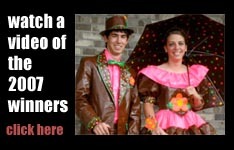 Hosted in the “Duct Tape Capital” of the world and home of Duck® brand duct tape  Avon, Ohio  the celebration will boast traditional festival favorites, including rides, food, games, live entertainment and booths from local vendors and organizations. Sticking to the pirate theme, festivalgoers can also take part in a treasure hunt, pose with their favorite pirate for a picture and much more! Duck® brand duct tape, title sponsor of the event, will celebrate the sticky stuff with a unique display of duct tape sculptures and fashions created by local artists and students. 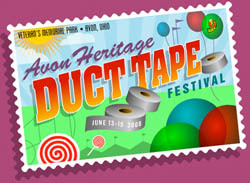 The Avon Heritage Duct Tape Festival begins on Friday, June 13, from 4 p.m.  11 p.m., and continues on Saturday, June 14, from 11 a.m.  11 p.m. Festivalgoers will have one last chance to enjoy the celebration on Sunday, June 15, from 11 a.m.  5 p.m.
For additional event information, directions and local accommodations, call toll-free, 1-866-818-1116 or visit www.AvonDuctTapeFestival.com. Make sure you're on our email list! Click here - to subscribe. 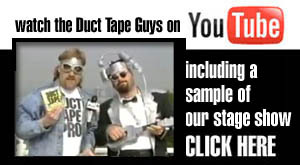 In case you didn't visit our YouTube site, you're missing a lot of great Duct Tape Guy videos from our past television appearances, out-takes, goofball antics, etc.. We're working on getting a video of our entire half-hour stand-up show (Which should be posted in June by Father's Day.) 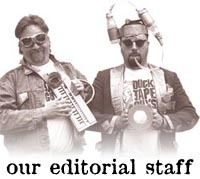 And, if you have any video of the duct tape guys in action, please pass it by us first before you post it on YouTube - we want to keep the Duct Tape Guy (crud) quality to everything out there that represents us. Okay? Thanks. her economic stimulus check. She went to my sister's house to do it on her computer with Turbo Tax. The filing part was no trouble at all but you had to come up with a user name and password to sign in. They also asked you for a security question in case you forgot your password. My sister picked "What is the name of your first pet?" and put in "Spunky". My mother, who was not familiar with computers, then said that her first pet was "Mother Cat" and she should really put that. She said, "What if they check? We better not mess around!". Later I called my mother and asked her if it was worth the ten minutes it took to get the $300. She said, "Yeah, I guess so but I still don't know why the heck they need to know my cat's name!". If you went by the kinds of things sold in stores in tourist towns you would think that people were sitting at home looking in their drawers saying, "You know, I think I need to go on vacation. I don't have enough T shirts with pictures of cartoon moose on them." I have a friend who was 37 years old and living in his parent's basement. He decided he had had enough and so he got married, bought a house and had kids. Now he is living in his wife's basement. Finally, here is another helpful hint for living and this one could literally save your life. When your wife gets a new outfit and asks what you think of it, Never, no matter how much of a compliment you think it may be, tell her it looks slimming. Never! 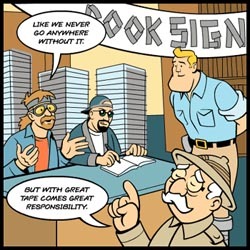 < The sign on the left and other remarkably stupid road-side sites can be found at Tim's Parodyville Drive-By Shootings pages. How Can I Miss You if You Won't Go Away? A musical tribute to Hillary Clinton featuring the swingin' music of Dan Hicks. Trivial information that you can use to have the appearance of being smart. Fun facts about the human mind and body. The average woman is five inches shorter than the average man. When you are looking at someone you love, your pupils dilate. When you are looking at someone you hate, your pupils also dilate. 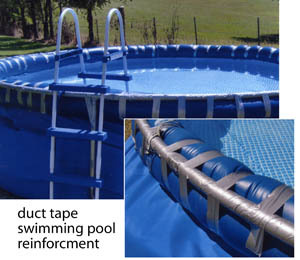 Swimming Pool Reinforcement How do you keep a sagging pool upright? A ring of those foam pipe insulation tubes wrapped in duct tape and taped to the top right of the pool. Sorry that we lost the submitter's name - but this is a great idea never the less. Remember if you send us photos, put your name on the back of them so we can credit them properly! We love Ireland and the Irish. This collection of Irish jokes was sent to us by an Irish friend. enjoy! asked him if he was already homesick. "Father, have you been drinking?" The priest says, "What did he want, Mary?" "He said, 'Please Mary, put down that damn gun."" 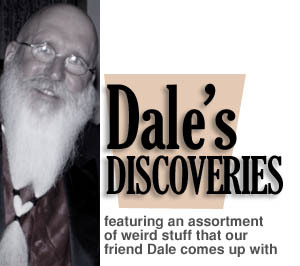 The pet rock of humor books? Click here to get a $2 off retail price of $4.9-5 each (autographed of course). Or, get the FRAT PACK - a ten pack for $35 (instead of the $69.50 retail - heck, that's wholesale!). 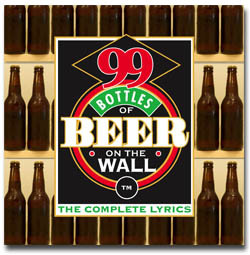 Great gift for the BEER LOVER in your life. Cheers!